It is Russian folk art. Khokhloma is instantly recognizable, its design featuring a barrage of berries, swirls of golden leaves, and an assortment of birds, complemented by freehand brushstrokes; It’s the art of Russian Khokhloma, and it's popularity as a Russian craft. The process of crafting a piece of Khokloma can take anywhere from two months, to four months, depending on the size, and intricacy of the design. After the wood is prepared, and cut into the desired shape, a thin layer of brown clay is applied by hand, and the piece is heated in a kiln. Next, the piece is primed with up to three coats of oil; originally flax seed oil was used, however a synthetic replacement is the norm today, the oil is then left to air dry. The distinctive gold color, which is the trademark of Khokhloma pieces, originally starts out as powdered aluminum (or in the past, powdered tin, or sometimes even silver) which is again heated in the kiln, after being decorated with heat resistant paint, and varnished. The extreme temperature turns the powdered aluminum a glistening golden color. Khokhloma folk craft is constantly growing and developing, while at the same time remaining true to its original roots and themes. Adopting the best traditions, one generation changes another, and using modern materials and paints, the art has become diverse, and its colors more vibrant and rich. It is not accidentally that Khokhloma art is so popular either in Russia or abroad. Khokhloma design can be seen gracing the tails of some British Airways Boeing 757s, it can be seen on the adorning the sides of world class racecars such as the Lada Kalina Super 1600, it can even be seen on t-shirts. New shapes and canvases waiting to be painted with a Khokhloma design are all around us, and we will be able to become the eye-witnesses for new applications, and uses for the timeless, instantly recognizable, and unique design. 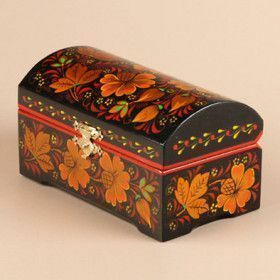 Pick out an authentic Russian Golden Khokhloma lacquer box if you're looking for a unique home decoration or a gift.